Have you ever stopped to consider what they thought about armour in the early 17th century, or why so many fines were levied for mustering without armour (and still remain unpaid). The frequent repetition of the requirements for armour may have been more observed in the breach than the observing. Let’s have a look at a small sample of contemporary authors to convey a little of the sort of thinking that was beginning to happen in England. The first few quotes below are from A New Invention of Shooting Fire-Shafts in Longbows in 1628 by “A True Patriot”. Their weight (I confess) is little to an able man… when slender fare, and hard lodgings abate men’s strength, and the shape of the body must be constrained within the Corslet (as commonly men see in service); and amongst trained soldiers (where Master to his servant or farther to his son deliver arm as they have made them for themselves, or for some other of more unequal stature) … the encumbrance is so great that hardly any patience can endure it long. They foul and fret men’s clothes and add extremities to the excess of cold and heat: so that in winter men are loath to put them on, and in summer they throw them off in spite of all command. The help is, on a march to put them into carts, where either much time must be spent (too precious) to pack them up in order; or they must (as they commonly are) be thrown together on heaps, that when they are taken off again upon occasion, they are so bruised, broken, and confusedly disjointed, that men which put them on seem restrained in irons than harnessed with an armour of defence. So we have the situation where arrows work against unarmoured troops, but you need bullets if the enemy is armoured. John Smythe agrees 1, and gives an example, “But the Duke, at this time Lieutenant General … seeing many Captains and Officers of footman were armed at the proof against the Harquebus, he to the intent to frustrate the resistance of their armours, did increase the numbers of Muskets, the blows of the bullets of which, no armours wearable can resist.” Still, he argues armour has a place in ‘modern’ warfare to protect against bullets at some distance, if Sir Philip Sidney had “worn his cuisses, the bullet had not broken his thigh bone, by reason that the chief force of the bullet … was in a manner past.” Ill arming, he claims, is an encouragement to the enemy. Maybe you should get that armour after all. This is the point in the article where I find myself completely unable to resist a couple of diversions on the subject of ballistics: Benjamin Robbins, studying ballistics in the early 18th century, showed Smythe was right. In his tests, the round ball from a musket lost half its speed in the first 100 yards (five score yards), and was no longer lethal against an unarmoured man at not much greater distance. This research lead more or less directly to the design of the Minnie bullet. … Some number of archers being chosen, that could with their flights 2 shoot 24 or 20 scores (as there be many that can) may by the same reason fire volleys of flights at their enemies at 18 scores off, which both the one and the other are mockeries to be thought of, because there is no weapon in the field effectual, further than to a convenient and certain distance. Smythe goes on to tell ‘em they’re dreaming: “…a verie mockerie and dreame to bee thought on.”. 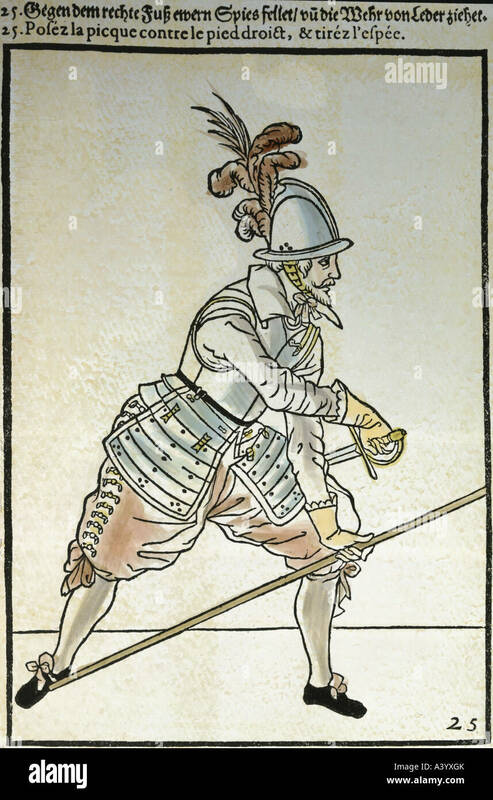 Humfrey Barwick, in A Breefe Discourse (London, 1594) talks about soldiers having 30 arrows sticking out of their armour, where “one Harquebus or musket shot would have dispatched the matter”. Contradicting Robbins’ experimental results, Barwick gives theoretical effective ranges for muskets, “It will kill the armed of proof at ten score yards, the common armours at twenty score, and the unarmed at thirty score” qualifying that these results are conditional on being “well used in bullet and tried powder”. In other words, under lab conditions. Barwick taught musketry to gentlemen, so maybe this may just be a marketing ploy. Either way, both authors show there is no real reason to keep armour as it won’t stop a bullet at a reasonable distance. …Archers reduced into their convenient forms, being in so great numbers … do dim the light of the sun, darken the air and cover the earth with their volleys of arrows, eight, nine, ten and eleven scores from them…no numbers of [Horsemen and footmen], being so ill armed as in these days they are, shall be found able to abide the incredible terror of the shot of such infinite numbers 4 of arrows. 1 Smythe, J. Brief Discourses, London, 1590. 2 Light streamlined arrows designed for long distance shooting, mostly used in as an irritant to drive the enemy away, or towards you. Then you use the heavier shafts when you can see the reds of their eyes. 3 Curiously echoed in chapter 1 of Markham’s The Art of Archerie, the only chapter not plagiarised from Ascham’s Toxopholis, the Schoole of Shooting. 4 Infinite, meaning a very large number. I’ve just encountered the same sort of use in my network studies where the phrase “count to infinity” in a network loop means “increment a counter to a very large number, typically between 6 and 15”.